When the very talented Chef Nate Appleman departed San Francisco’s beloved A16 last year for the glitz of Manhattan, Bay Area foodies gasped, fell into a deep funk and believed the world had come to an end. I exaggerate — but not by much. But A16 did a very smart thing. For his replacement, the restaurant looked within. It promoted Liza Shaw to top toque. 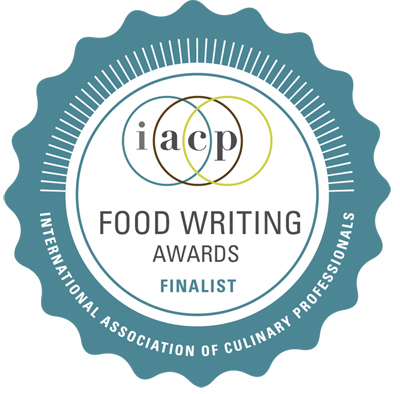 Shaw not only helped open A16 in 2004, but worked her way up through every station, and contributed to the recipe development and food styling of the award-winning “A16 Food + Wine” (Ten Speed Press). 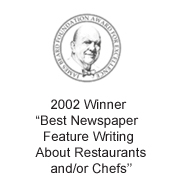 In her hands, the restaurant has remained every bit as strong and consistent. On a blustery night when I was invited to dine as a guest, the long, narrow restaurant a short drive from the Laurel Inn, was as crowded and boisterous as always. It was my first time dining on a Monday night. 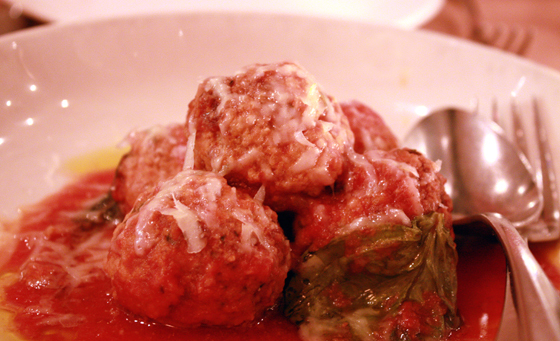 And you know what that means — “Meatball Mondays” was in full swing. 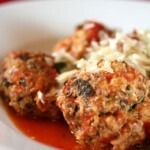 The juicy, tender meatballs are served as a special every Monday night as either an appetizer or entree. The meatballs, braised in wine, are a mixture of pork, beef and 40 percent breadcrumbs, which is what makes them so wonderfully light in texture. 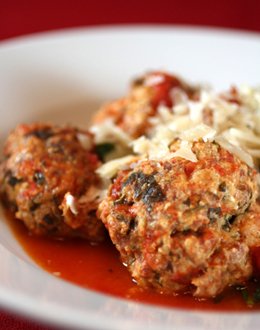 One bite and you’ll know why regulars caused a ruckus when the restaurant once tried to discontinue the meatball tradition. A starter of roasted Monterey sardines ($11) was surprisingly mild tasting for this oft-strong oily fish. 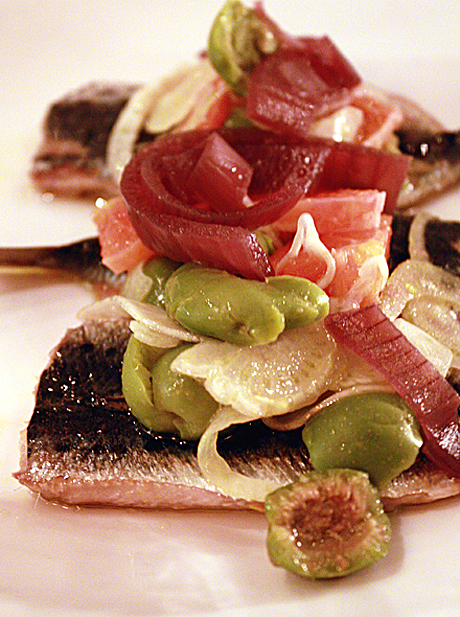 A hit of citrus, fennel and plump green olives gave the sardines even more character. 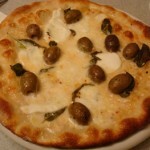 The pizza, which I’ve made at home many times, remains one of the best in the city. 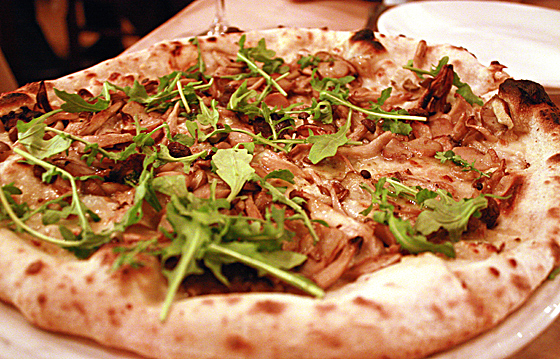 The funghi pizza ($16.50) was strewn with roasted mushrooms, smoked mozzarella, Grana, garlic, oregano and wild peppery arugula. The crust was crisp, with developed flavor and nice, airy edges. 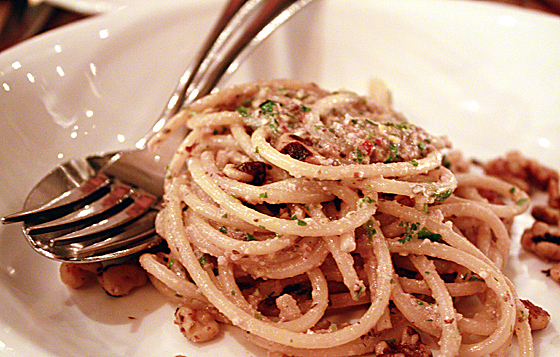 Pastas comes in your choice of full or half portions. We opted for the latter for two pastas. First up, the bucatini ($10) — strands of pasta tossed with a simple, yet beguiling mixture of walnut, Meyer lemon and anchovy pesto. It was nutty, salty and tangy — and we couldn’t stop eating it. 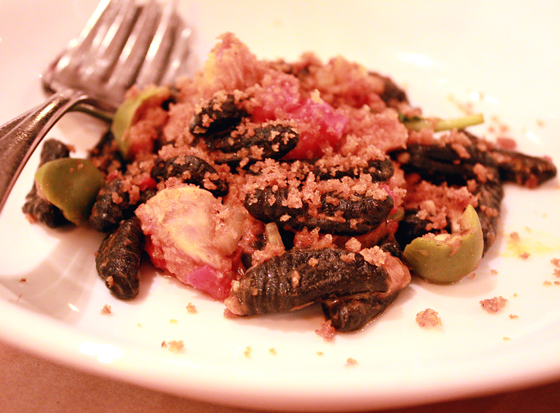 Second, the squid ink cavatelli ($10) — midnight-hued, quill-shaped pasta the size of mussels — tossed with house-made baccala (salt cod), cherry tomatoes, green olives and chiles. It was a dish infused with the deep flavor of the sea. A side of tender Erbette chard ($6) rounded things out. 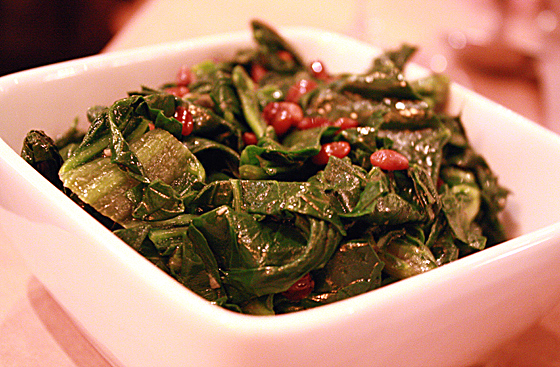 With leaves like spinach but without its mineral taste, the chard was sauteed quickly with pine nuts, currants, garlic and lemon. 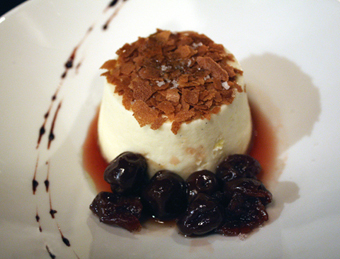 A flourish of rustic desserts followed. 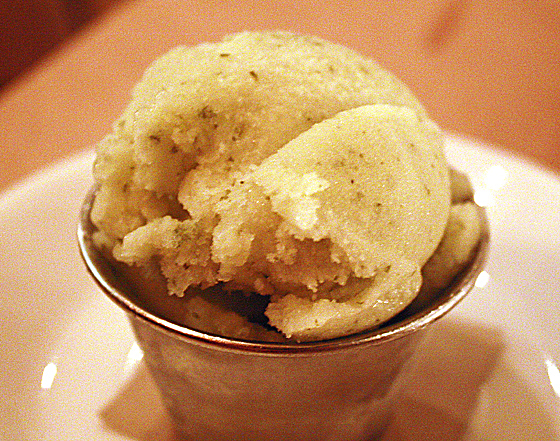 First, a zippy scoop of green apple-basil sorbet ($3) that couldn’t have been more refreshing. 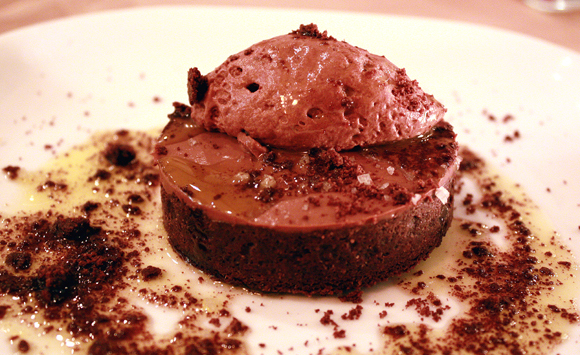 Next, the chocolate budino tart ($8.50) drizzled with sea salt and olive oil that was oh-so rich and satisfying. 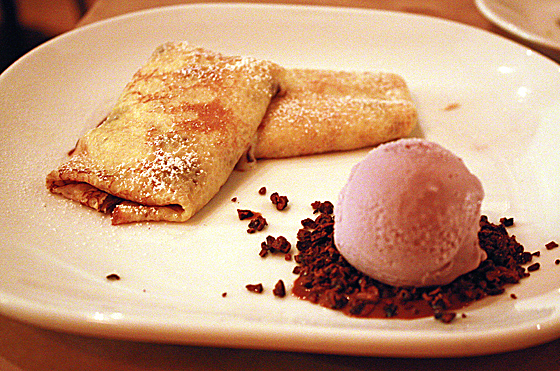 And finally, the crespelle ($8), tender crepes folded around stracchino (a creamy, Italian cow’s milk cheese) and oozy dark chocolate. They were served with a faintly pink-purple scoop of gelato made with the Italian wine, lacrima, full of bright berry flavors. Appleman may have flown the coop. But fortunately for those of us in the Bay Area, A!6 is still very much in good hands. same demographic will tell you, the recipe is a secret which must be pulled from my cold hands only upon my demise. lol. Everything looks divine. I’m intrigued by that green apple sorbet! I went to A16 only once a few years back and had a VERY disappointing experience–I really was shocked at how much praise it received based on my poor experience. But, I think it’s time to make a return visit and give it another try. Love your photos. Absolutely gorgeous! A16 sounds like a great spot. meatball mondays? how excellent! 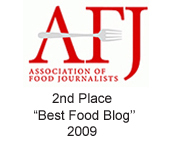 i only know of mr appleman from ‘the next iron chef,’ so clearly, i dislike him. looks like his replacement is doing just fine! 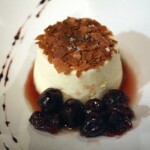 The bucatini looks wonderful it’s simple but delicious. Scrumptious meatballs and I would love a taste of that decadent chocolate tart! You’ve reminded me I have not been in a while – need to head back soon! This meal looks incredible. What I would do to gobble up those sardines. I will have to make a point to drop in the next time I’m in SF. Glad to hear that A16 has not lost its panache. Gah, your description is making me drool like whoa. 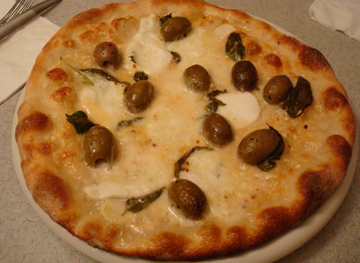 That pizza is the best-looking pie I’ve ever seen! The only thing A16 needs to do, apparently, is lighten up…literally. I’m guessing that place was dark? Good to hear! The last time I picked up the book, I wondered what was happening at the restaurant. Wish I could grab that pizza off the screen. I live in L.A., but my brother lives in San Francisco. I’ll have to recommend this restaurant to him. Love your photos. I’m so glad to hear that A-16 is going strong. Our dinner there was one of my favorite meals in 2009.